Sea Green will be the color for February. Anything between blue and green will work. From teal, to aqua to turquoise. Try to find anything that isn't happy with blue or green but plays somewhere in between. I've still got a few aqua circles to sew, but they are starting to come together. 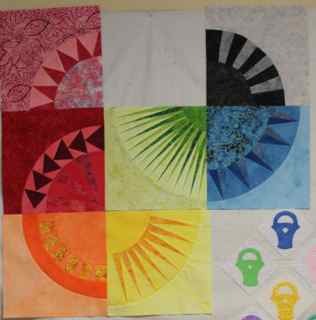 Be sure to stop by tomorrow for our end of the month finished quilt celebration. 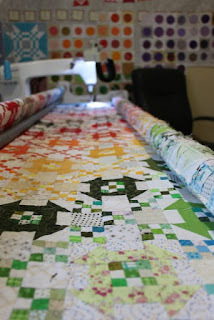 Any flimsy or quilt worked on as part of the Rainbow Scrap Challenge will work. 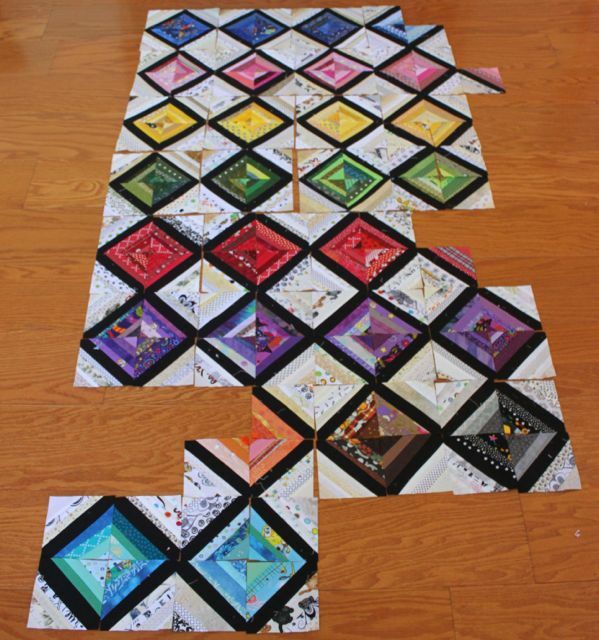 I spent yesterday morning loading OMG onto the quilting frame. This quilt was the ultimate scrap buster. 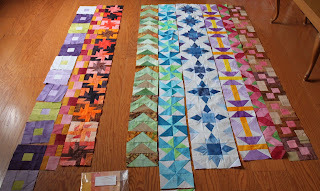 I'm not sure how many 1 inch strips I used in all of those tiny nine patches, but it was a lot! First I had to extend the frame and clear everything off. Pinning the quilt to the leaders and getting it all ready to go took most of the morning. I got the thread picked - light pink -- and had just finished sewing through the first bobbin. 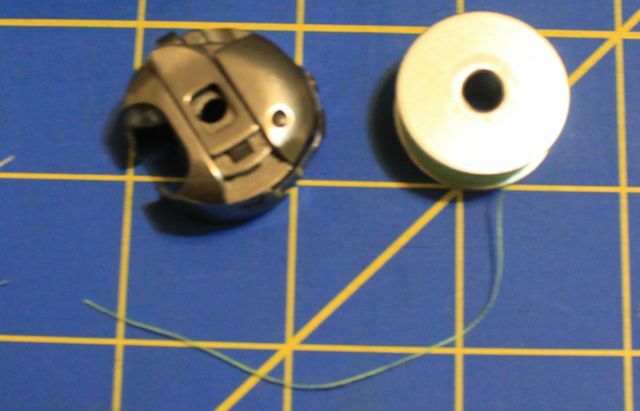 Somehow, in the time that it took to load a new bobbin, I managed to loose the bobbin case. I looked everywhere! Hours later, everything had been cleaned and organized and searched. The lost bobbin case was nowhere to be found. So strange! Stuck in the middle of a quilt, I finally gave up and went online to order a new case. After dinner I went back again and started dumping things out. Eventually, the bobbin case turned up. 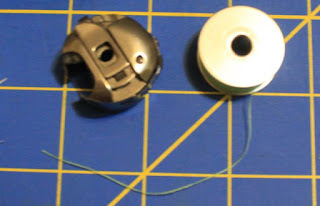 Hiding inside a spool of thread. What are the odds? So OMG didn't get finished yesterday as planned, but more fast stitching will happen today for sure. After a few hours of fast stitching, I will definitely feel the need to settle down with some more slow stitching. 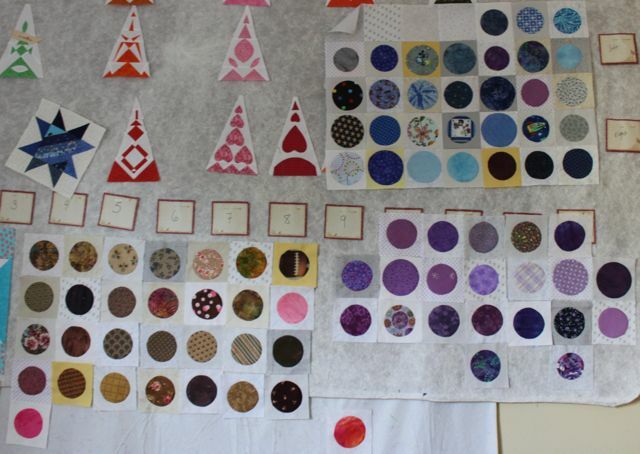 I finished all the prep work on my 366 circles last Sunday. 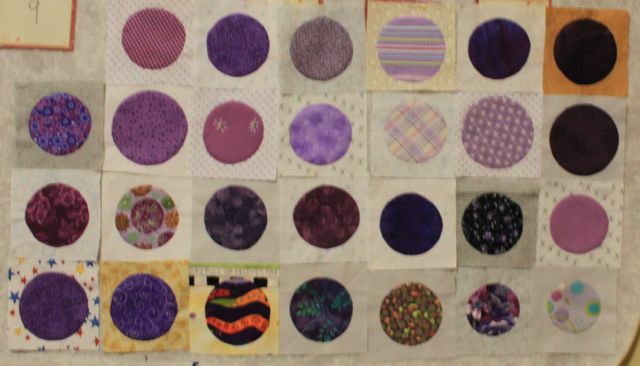 There are just enough circles sitting on the ironing board to finish off the quilt. Now all that I need to do is to finish a tiny bit of hand stitching. 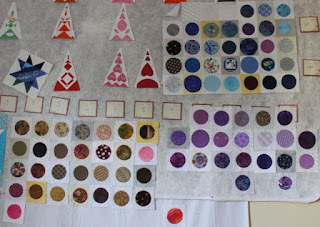 I'm linking up with Slow Stitching Sunday and Oh Scrap today. 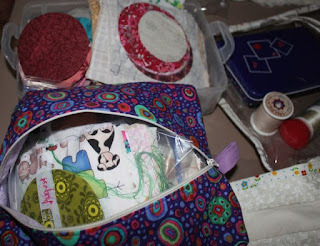 So I guess a little blog hopping will happen before it is time to get back to stitching. I hope you are all enjoying purple this month. 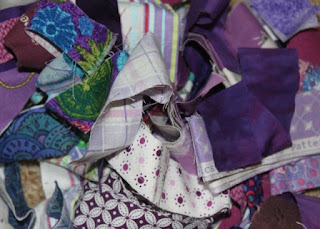 Today is your last weekend day to play with purple scraps. Hopefully you can start to see the bottom of the purple bin by now? Don't forget that our special end of the month finishing celebration is coming up soon. 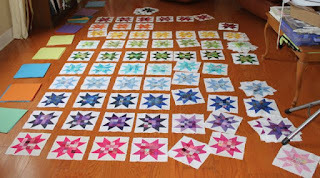 There will be an extra linky party starting Tuesday for anyone who has finished a RSC quilt. Be sure to check back then for lots of great motivation and inspiration. Work has kept me hopping this week and I haven't had much time to sneak off to the sewing room. So glad to have a weekend ahead to find some time to putter around with purple. I started strong on the circles last year. Then life got in the way. It was a busy year for work and my sewing suffered. January has been done for ages. Blue was the color of the month last year. Brown and pink are finished for February. There are 4 more purple circles sitting next to my spot on the couch. Those will finish off March. April needs 4 more blocks as well. They are in my "to go" bag ready for stitching. May, I think I also needs 4 more. 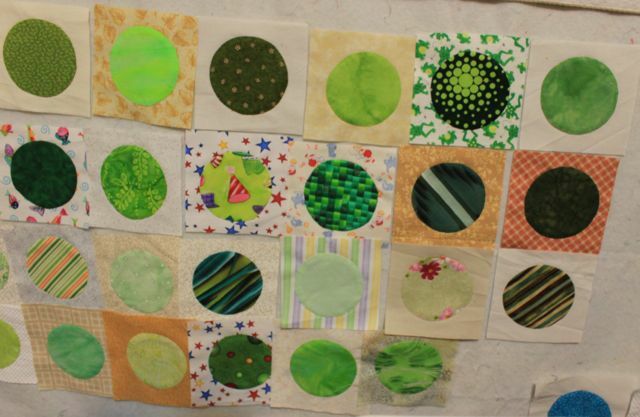 I sewed a lot of green circles while we traveled to Nana's funeral after Christmas. After that, it starts to get more sparse. Still that is half of the year almost done. I'll get those odds and ends all sewn together and start to think about the second half of the year. One step at a time. 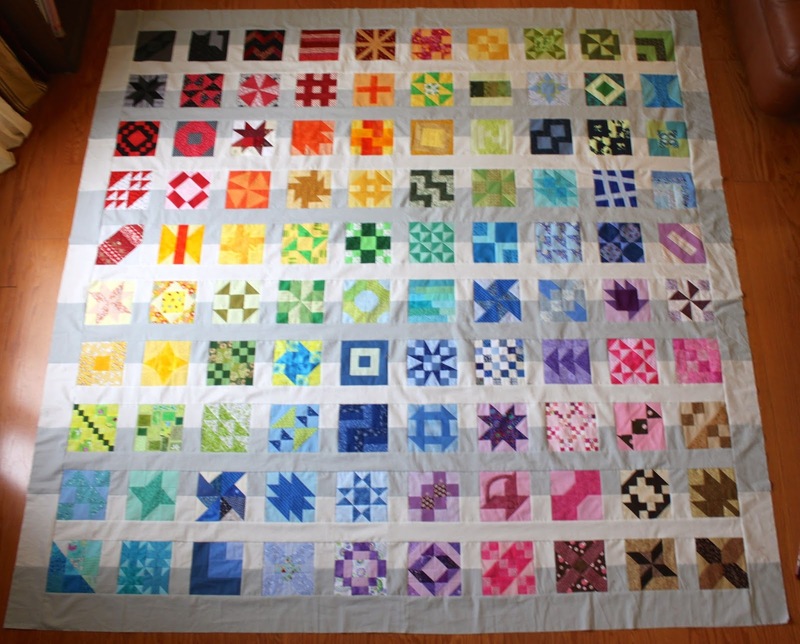 This has turned into a two year quilt, but I do enjoy the way it is coming together. There isn't much going on today. I did most of the laundry yesterday while most of the family was gone. They all came home exhausted after the Lego Tournament. Everyone has homework to work on today so they should not need much entertaining. 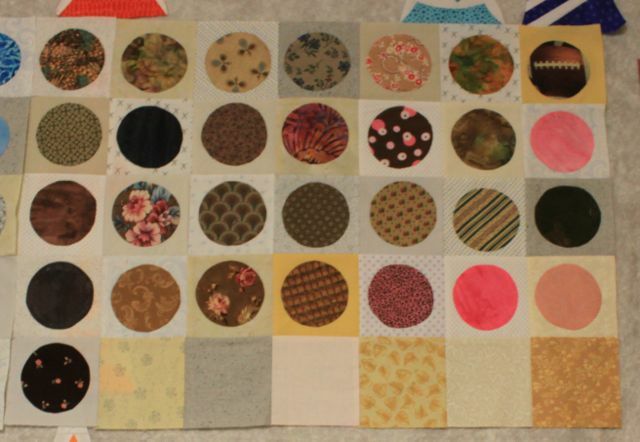 I'll sew up a few more circles before it the day gets into full swing. First though, I'll head over to Kathy's Quilts and see what other people have going on in the way of slow stitching. I really wanted to use this turkey print on the back of OMG. 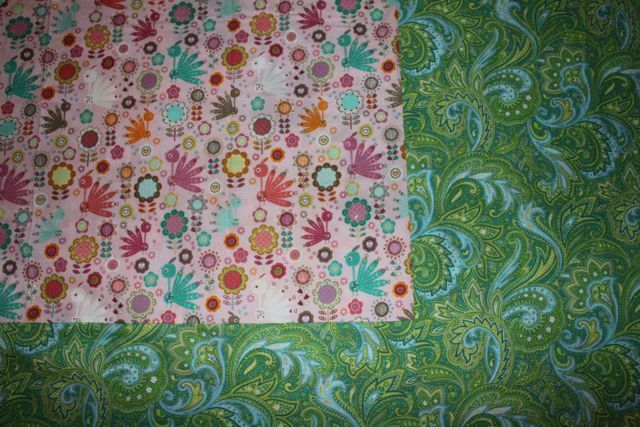 It didn't play nicely with any of the other high yardage fabrics in the stash, so I went searching and found a nice aqua and lime paisley print at the fabric store not far from the binding fabric. 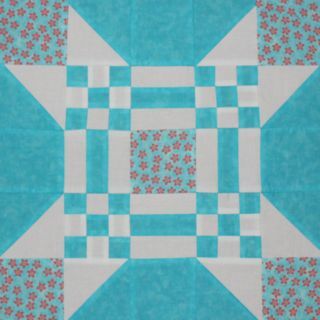 A framed square is my favorite pieced backing. It looks like it is on purpose, but can be used with a nice combination of whatever lengths are available. Lizzie came to help of course, she is a great fan of quilts. This was her helping me with the borders yesterday. She's great company. When all was said and done, this is how much extra fabric was left. Yikes! Maybe I cut that a little too close? I any case, I sewed. On a school night! Shocking I know. Kurt is out at volleyball and he will bring Ryan home from Robotics on his way. Anna is starting to drive herself now and Sydney decided to skip lacrosse. Just another nice calm weeknight. I guess I'd better get everything up off the floor before everyone else decides to start traipsing across the family room. As soon as a quilt get spread out on the floor, Lizzie is right there to help with the final inspection. Both borders are on and the back got partially pieced before pizza showed up for dinner. Sunday is usually pizza night, but we postponed it in honor of the three day weekend. 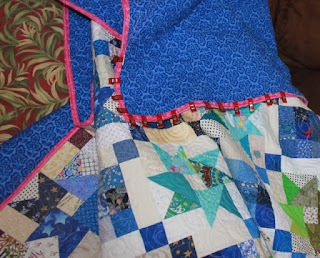 After the pizza was safely away, I pulled out the broken dishes quilt to take a few more stitches. 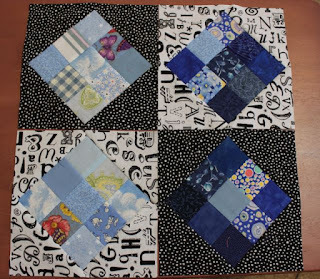 Even though all the center blocks aren't quite done, I cheated and got a start on the borders. I got quite a bit done while we enjoyed Alice Through the Looking Glass as a family. 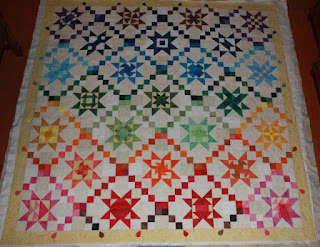 It took all of Saturday to get OMG It's a Churn Dash ironed and ready for borders. After auditioning several options, I decided on pink and teal. 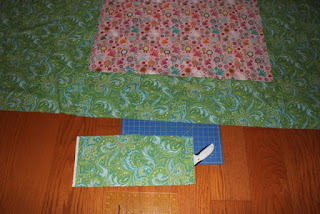 There was enough pink for a thin inner border, but nothing with enough yardage for a wide outer border. Off to the fabric store! 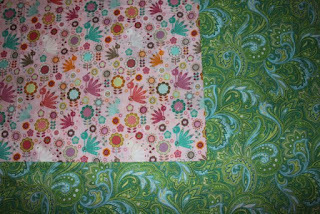 First though, I pulled some backing options. All the new fabric has been through the wash now and after a bit more time with the iron, I'll be down on hands and knees again for the rest of borders and backings. Happy Martin Luther King day! So happy to have an extra weekend day to play. I spent most of yesterday pressing OMG. SO many seams! I should have planned better how they would nestle while I was making the blocks. That failure led to a lot of manual seam turning during assembly, which meant that all the seams needed to be re-pressed in the flimsy so that they would lie flat. Planning! So over rated. Thanks to lots of spray starch and many hours with a hot iron, it is now flat as a pancake and stiff as a board. I initially pulled a traditional red and blue for double borders. 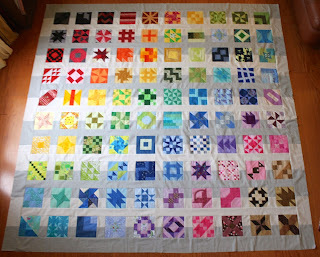 Now that I am looking at the picture of the finished flimsy though, I see a huge lime green band on the large central diagonal with hot pink bands on either corner. I might pull something along those lines and see if it is too bright. First though, I might finish another broken dishes block or two. It is a three day weekend, which leaves me with an extra day to sew! Yesterday lost a lot of time to putting away Christmas and catching up on laundry. Today the kids are asking for movies. Tomorrow is all for me. I wonder what I will be able to get done? 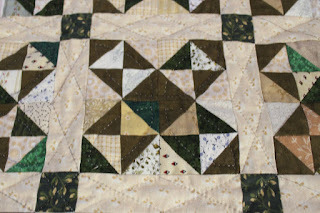 I am linking up with Oh Scrap and Slow Stitching Sunday today. You should visit and see what everyone else is up to before you get going on your day. 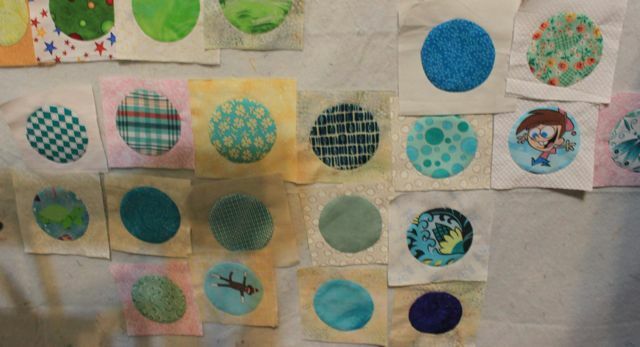 Many moons ago, I started using monochromatic nine patches with two inch squares as leaders and enders. First I made Mai Tai Sunrise. The alternate blocks are frames nine patches. It was so much fun that I kept making nine patches the next year and turned them into these double framed versions. This one was called Nine Carat Diamonds. So last year I had more nine patches, and set them aside to set as a square in a square with alternating light and dark triangles. These guys still need to be finished. 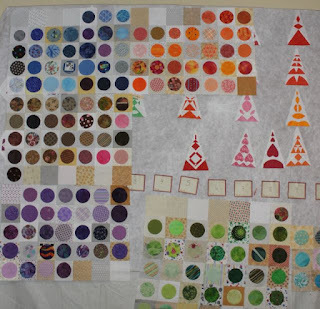 I have several finished rows and plenty of nine patches I think. They just need the corner triangles and a bit of assembly. So, speaking of finishing and assembling things. I could not help but to notice last week that A LOT of us keep making blocks year after year and failing to turn them into finished quilts! It seemed to be the recurring theme of last weeks post from all of our returning rainbow scrap quilters. 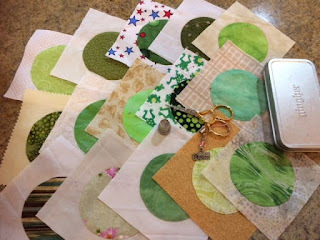 So, in an effort to encourage a bit more finishing, I am planning to have a special linky party on the last day of each month. 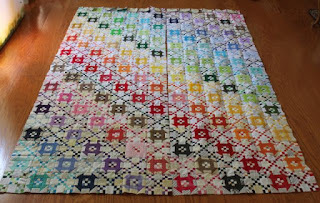 It will be reserved for finished rainbow scrap challenge quilts. The first linky will come on Tuesday January 31st. Start thinking now about whether or not you have a not quite finished rainbow scrap project in the wings that could be put together in time. Any finished top will do. It doesn't even have to be quilted yet to qualify. Until then though, every Saturday will still be business as usual. Misterlinky is ready to go today for all of your regular rainbow scrap progress. January is all about purple this year. Yesterday it snowed. So exciting! We are all ill prepared though. No coats, no gloves, no snow shovels or ice scrapers. 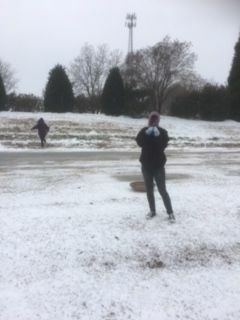 Honestly it was more ice than snow, but the kids thought it was super fun. Mostly, we have been gathered at Pop's house. The Ohio and Atlanta bunch showed up ahead of the storm, but we have lost lots of other family members to canceled flights and icy highways. We play cards, and eat, and there has been some napping as you can see. I made sure to bring along plenty of hand stitching to keep me feeling productive. I am happy to have these WIP cases to keep my work organized and ready to go. They hold plenty of circles. Hopefully these will be done soon. The Broken Dishes Blocks are seeing nice progress. 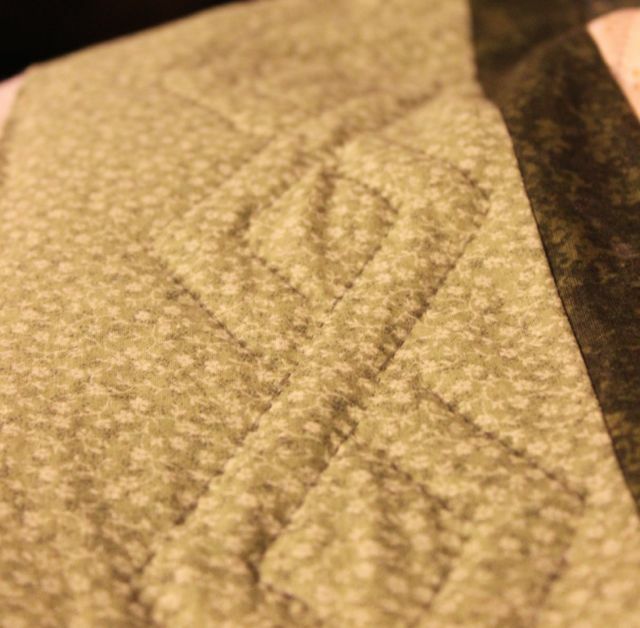 I used a frixion pen to mark the quilting. So far I really like how clear and sharp the lines are. I hope that I will still like it when it comes time to remove the marks. I practiced of course and it worked really well. Most of the middle is done I think. I am looking forward to moving on to the borders soon. I hope that you are all finding some time to slow down and take a few stitches on this day of rest. If not, you can still visit Kathy and enjoy other people's hand work at Slow Stitching Sunday. Welcome to the first Rainbow Scrap Challenge Linky Party of 2017! Purple will be the color for January this year. So grab a bin of purple and get ready to sew. 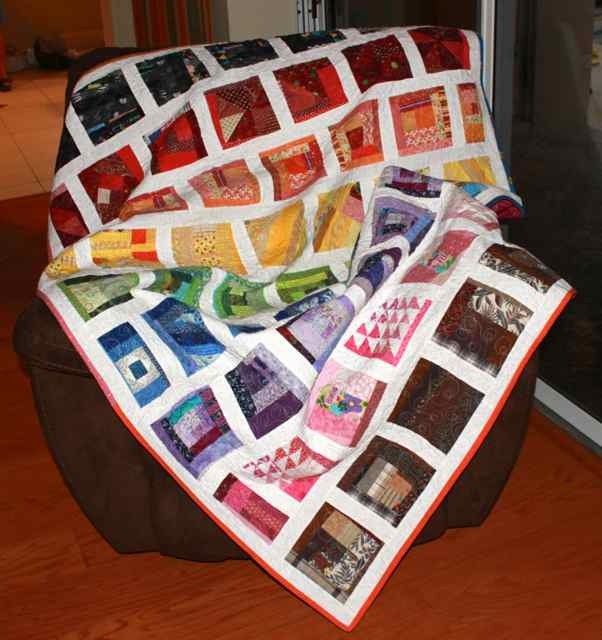 Today is the day for experienced rainbow scrap quilters to share finished projects from this year or from years past. Feel free to link up as many times as you like. 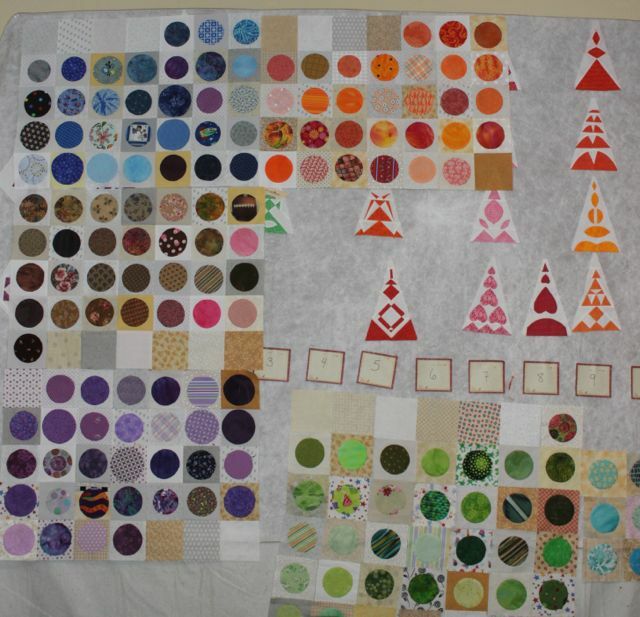 No need to create a new post, just take us back to the original post you used to share your finished RSC quilt. It is also the day to share your plans for the new year. 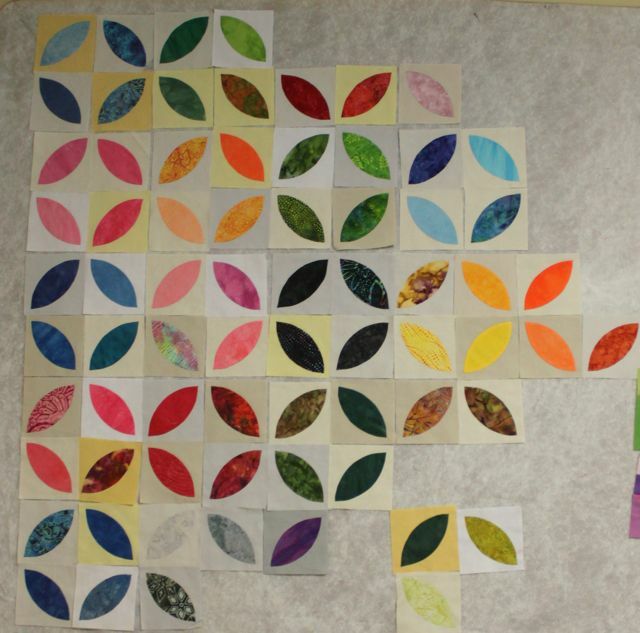 Tell us what blocks and patterns you would like to try out this year. If there is a link or tutorial for available, we would love to have a link to that as well. Including it in your post will help everyone else as they settle on plans for the new year. The most important part? After you link up, be sure to visit as many other people as you can and offer encouragement and kind comments. We will be back every Saturday to follow along. Feel free to link up as often as you like, and please don't feel guilty if you can't stop by every week. Life happens after all. 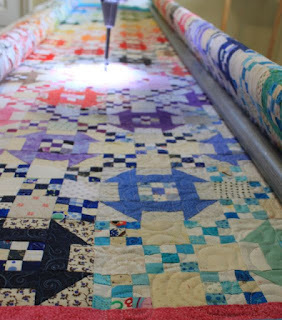 The number one rule at RSC is that there is no quilt guilt allowed. This is a hobby after all, not a job. It is supposed to be fun. While you are here. Feel free to go over to the right hand margin and grab my brand new button. If you copy the html code under it into a new gadget on your own blog, the button will show up. Then all you have to do is click that button to come right back to my blog. Handy right? Getting harder this year due to new HTTPS settings. I will figure this out. I promise. I used to use Grab My Button. But it doesn't seem to like the new security settings on blogger. Instead I found a new site. The Grab Button Builder. It seems to be working. I would love it if someone would try to copy the html code into a new gadget on their own blog and let me know if it works. 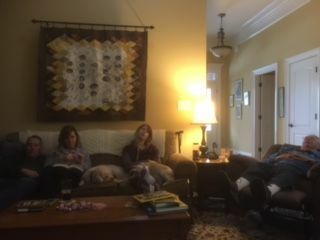 We are all hanging out in North Carolina watching the weather as we wait for people to show up from out of town for the memorial service on Sunday. Not a great time for traveling, but these things can't be helped. I make a new button exactly once each year. I always have to relearn the process because I don't do it often enough to remember. I seem to remember that posting a picture online is the first step though. I'll let you know when I get everything figured out and will post some directions and a link over in the right hand border at the top. Wish me luck! It is hard to ponder ongoing projects while away from home. Since I am in North Carolina for a few more days with plenty of time to spare, I'll do the best that I can from memory. I feel that I have a lot of projects in the works. I'd like to focus on finishing some of them off this year rather than starting new projects. The pictures are not necessarily representative of the current state of the projects, but they are what is available away from home. I think I'm about halfway done with the New York Beauty Blocks. I was experimenting with designing my own blocks for paper piecing. I learned a lot working on these blocks. I did all the prep work ahead of time, so finishing them off should not be too time consuming. I started this Mizzou Puzzle block last year. I think I only got about 4 months worth done? They are really big blocks, so I shouldn't need too many more to have enough for a nice quilt. I've been having a lot of fun with these string blocks. Maybe because my main sewing machine needs to go in to the shop and these work well on my back up machine. In any case, I'm not out of strings yet, so these will keep going for a while longer. This design wall shot shows two of my ongoing projects. The Dear Jane triangles in the background are for the border to the already completed center section. I pulled these out at the begining of last year and made very little progress. Will this be the year I finally complete the entire quilt? The circles are all all prepped, but there is still more hand sewing to be done. I finished 15 on the trip here, so that is a start. I think these framed nine patches are almost done, I just need to pull them out and put them all together. 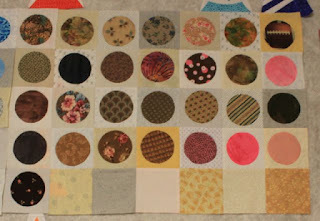 The OMG It's a Churn Dash top is done, I just need to press the heck out of it and decide on borders. And finally, the row by row. Again, all the blocks should be done. Now to put it all together. 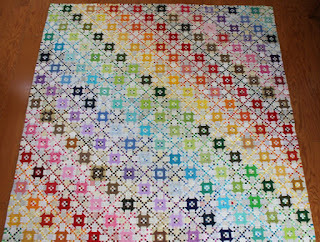 Yet another quilt with all the blocks done. They just need to be sewn together as well. I am sensing a recurring theme. 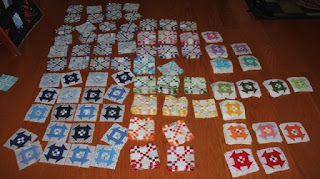 I like to make blocks, but should take the time to put them all together when they are done. Oops, almost forgot about these postage stamp stars. 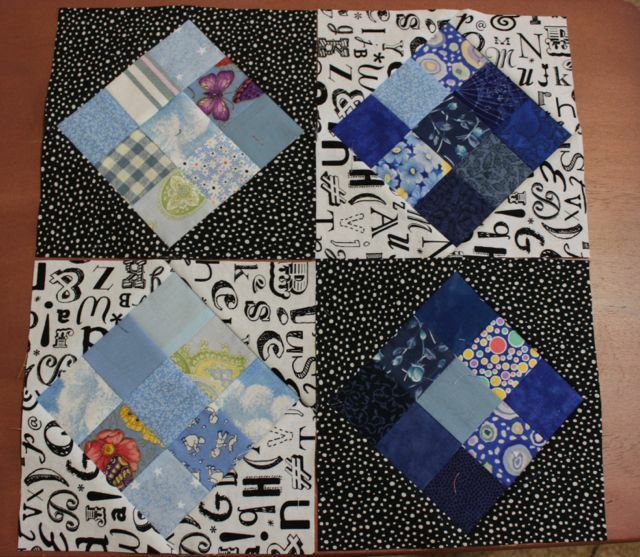 There are enough blocks finished for two quilts. I even cut out sashing and cornerstones. Better get those all sewn up into quilts. So, I think that is the list for the new year. 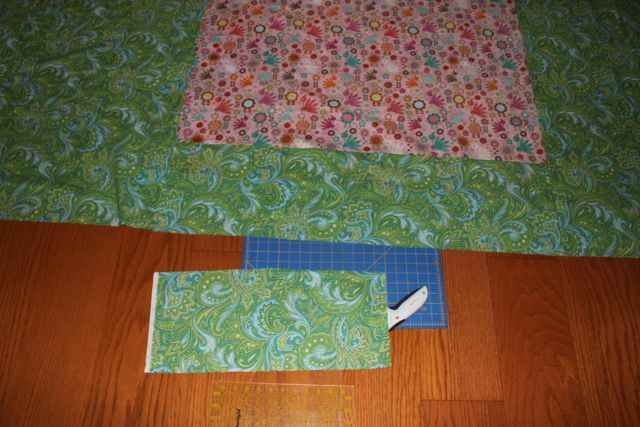 There are a couple of other possible projects in the quilting closet, but I think this is plenty to start with. 12 hours in the car gave me plenty of time to applique these 15 green circles. It would have been more, but I quit when it got too dark. It should have been 10 hours in the car, but wow was there traffic. We are hanging out with Pops now. People will start showing up on Wednesday or Thursday. The ceremony is on Sunday. Until then, we are just trying to be useful. Pops would like us to sort through Nana's clothes and clear out some of her personal items. Right now I'm doing laundry and hanging out with the dogs. We've been doing this for... well... a few years now. Somehow I don't seem to be out of scraps yet. (Big Grin). 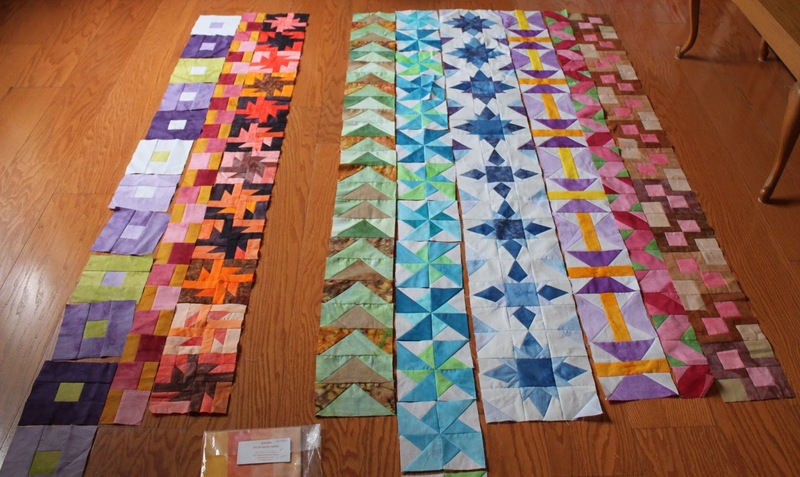 One lazy Sunday, I sat playing with scraps, and for no particular reason, sorted them into brightly colored stacks. Those piles of scraps held so many possibilities that my mind just couldn't stop running through them all. The thought of using them all at once though, seemed just to overwhelming to ponder. Instead, I thought it would be fun to take just one set of colored scraps each month and see what it might turn into. 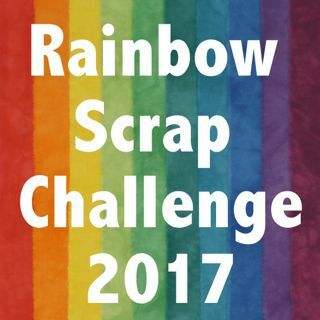 And so began the Rainbow Scrap Challenge. 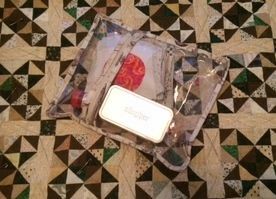 I invited my blog friends to play along, and tried to offer encouragement and ideas when I could. The real fun began though, when the inspiration started to flow from one rainbow blogger to another. It wasn't long before the weekly linky parties began, giving everyone a chance to share and sew together. 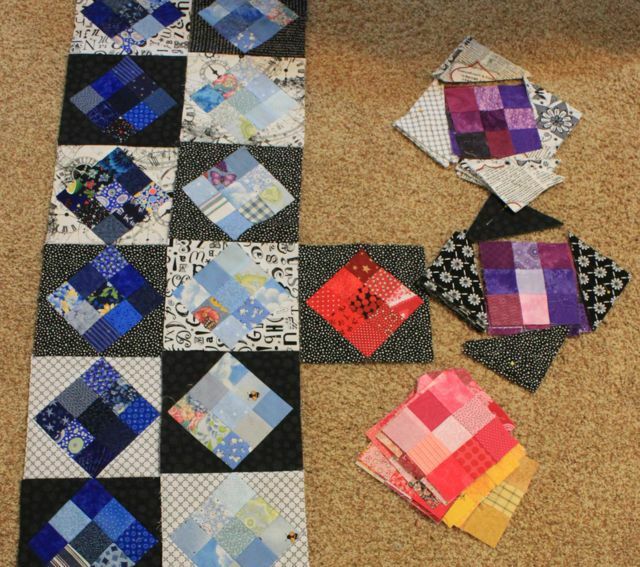 Sometimes I even planned out quilts ahead of time, and offered tutorials for those who wanted to join in. The basic idea though, has always remained the same. 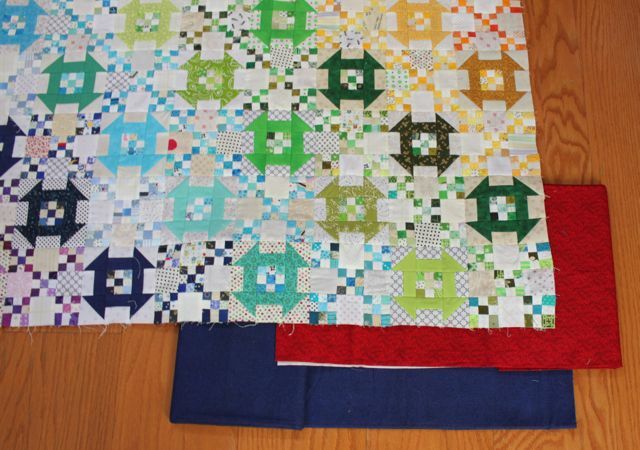 Take your scraps, and use them up, one color at a time. 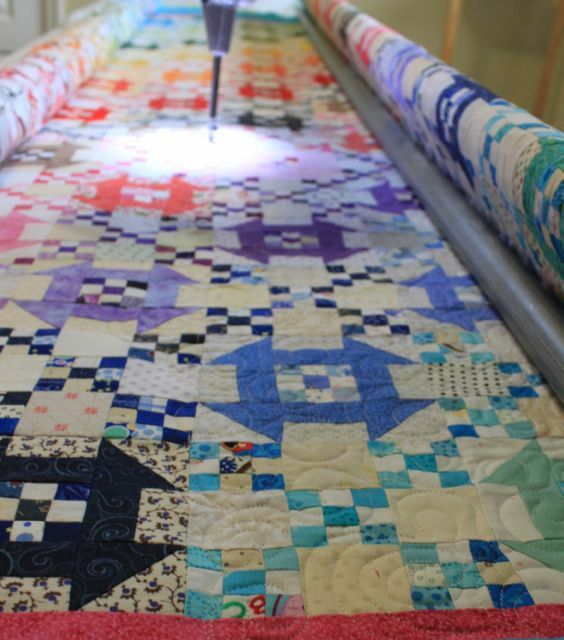 Along the way, more than a few rainbow quilts have been born. Like this Mai Tai Sunrise. And this OMG It's a Churn Dash, which is still in the flimsy stage. Or even these crumb bricks which turned into my favorite snuggle on the couch quilt. So if you are looking for a little inspiration this year, I invite you to join in to the Rainbow Scrap Challenge 2017. I will choose a single color for each of the first 11 months, leaving the December for finishing. Start by grabbing a handful of purple scraps and turning them into something. A mug rug, a placement, a single block. If you like to plan ahead, you can start now making blocks that will be ready to turn into a rainbow quilt by the end of the year. 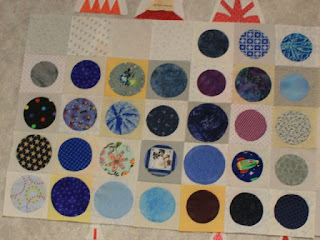 Not sure what block to make? That is where the weekly linky party will come to the rescue. 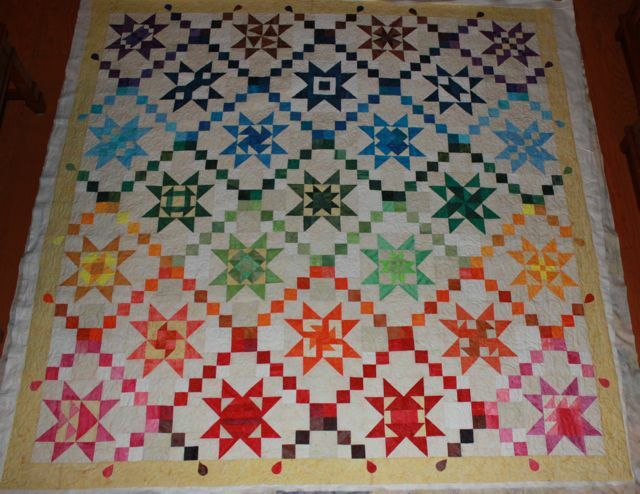 Just start looking at all the rainbow scrap quilts that others have made, and find the one that calls to you. 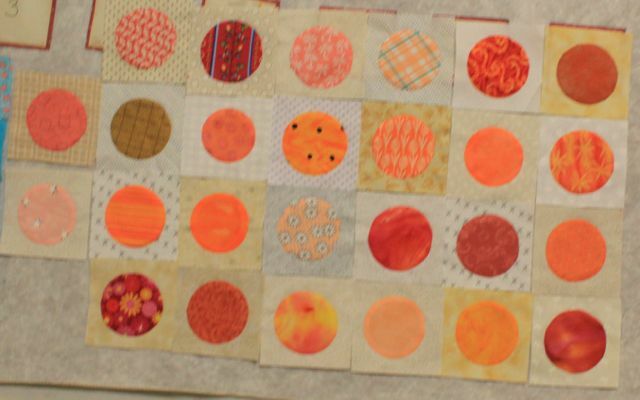 Or just pick a block you really love and start with that. You could even find an existing project featuring the color of the month and work to finish that up. The details are all up to you. It can be as simple or as elaborate as you like. Remember, it doesn't have to be done right away, as long as you are taking your scraps, and turning them into something, you are making progress. 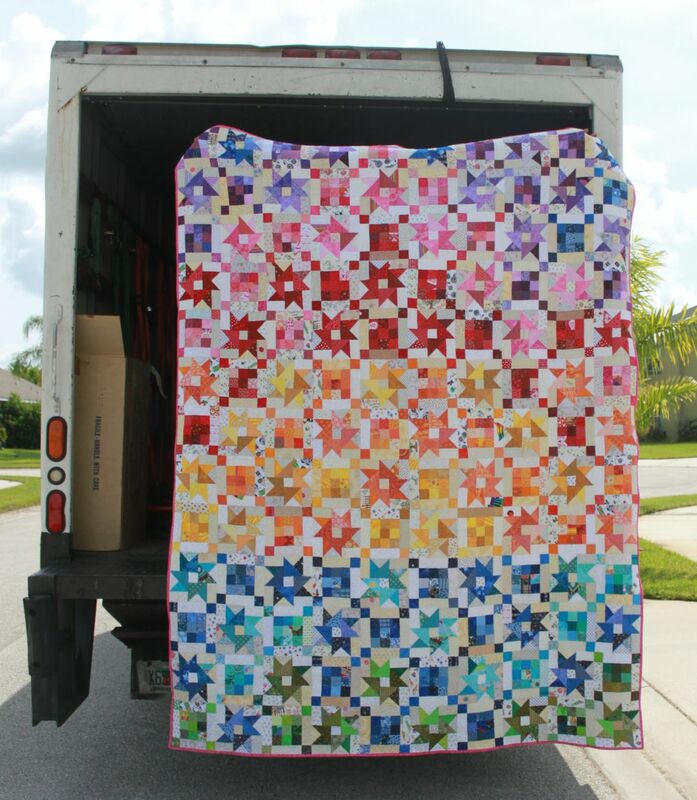 So, for all the veteran rainbow scrap quilters out there, I am asking for your help. Saturday January 6th will be the first ScrapHappy Saturday of 2017. 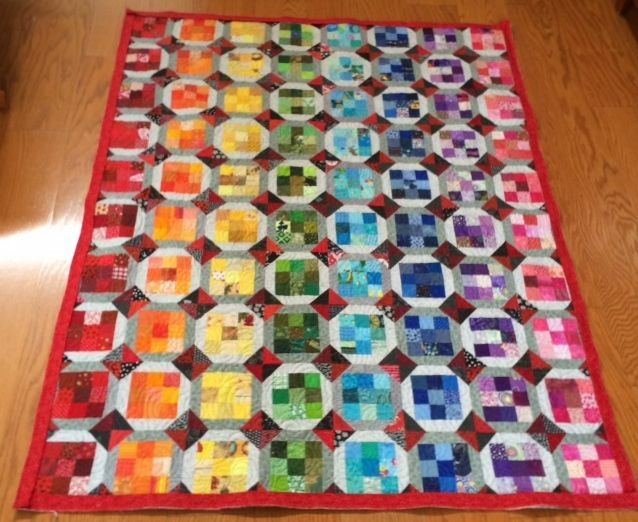 If you could have a finished Rainbow Scrap Challenge quilt or two ready to share, it would be a great inspiration for the new people. 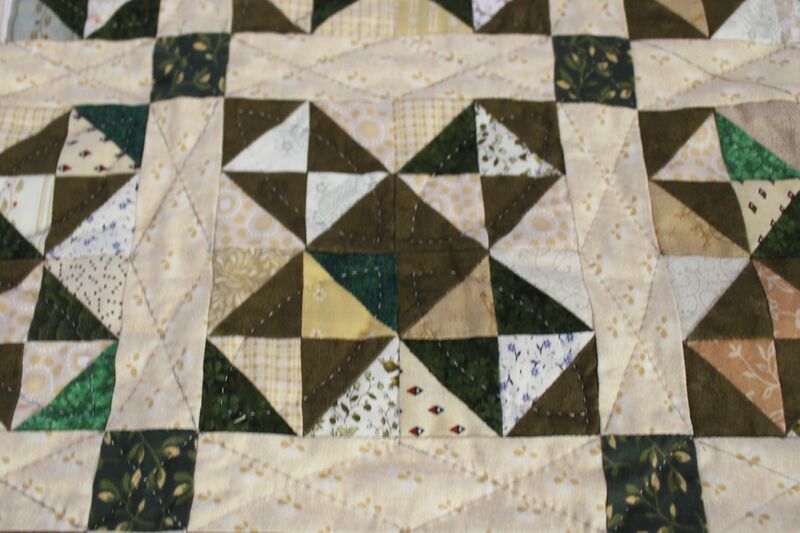 It doesn't have to be a new post, feel free to link to a finished quilt post from the past. I'd love to bask in all of your accomplishments though, and to show everyone the power of using your scraps.